I've just bought used 2011 saab 9.5 2.0TTiD4 XWD Aero, and I'm really happy with the car! Since car had E40D firmware version, I've decided to updated it. By mistake I have updated it with USA version U803 and now my sound is not working, it just pops from speakers. After I realized that I have put wrong firmware, I have updated car with with E800 version, but sound is still missing. 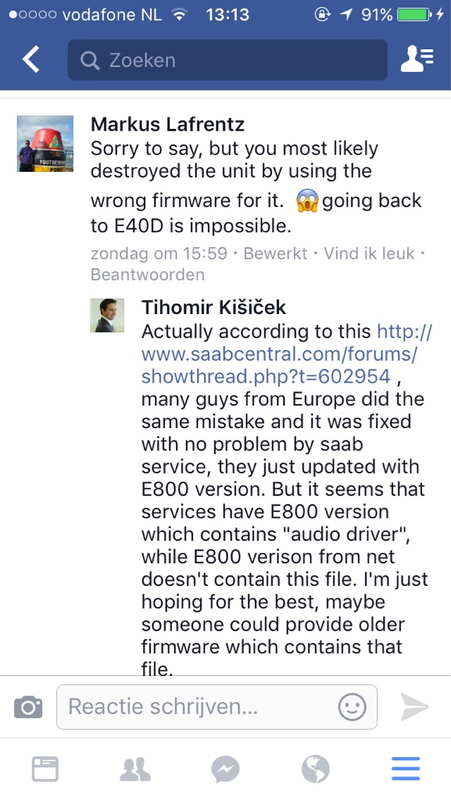 I would be really gratefull if someone can provide me with E40D firmware so I can install it and after that I will install E800 firmware, or is there any other fix? So, as you can see file named FAA_BC06.VBK is missing in E800 firmware and this exact file is culprit why audio is not working. First time I have flashed U803 firmware and after that I have flashed E800 firmware. So, currently in my car I have working E800 version but with bad "audio driver" from U803, since E800 firmware didn't come with "audio driver". I need E800 firmware (or some lower E40B, E400 or whatever) which has .VBK file(audio driver). Could someone provide me that file? Did you contact the SAAB dealer in Kiel (Germany) ? No I didn't, I'm from Croatia..
Do you think they would share firmware with me? Has anyone had any success before with some requests from them? Contact Markus Lafrentz in Kiel, he is the expert wrt NG's system! 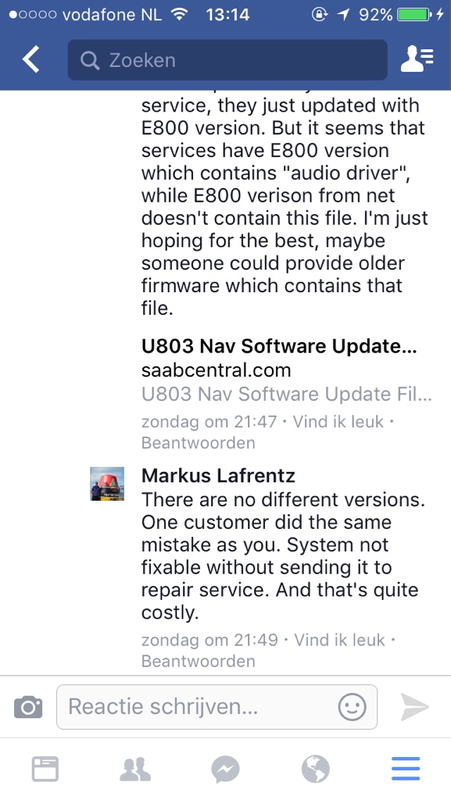 Markus Lafrentz already replied to your message on FB, saying you probably ruined the software and there's no turning back to the software where you came from. See FB. From what I read in this thread Lady9-5NG hasn't had firmware problems?